On Friday night, two St. Louis County police officers shot and killed 23-year old Thaddeus McCarroll after he reportedly came out of his mother’s home with a knife and Bible in his hands. That’s right, one man armed with a knife and book posed a threat to an entire “Tactical Operations Unit,” and was shot not by one, but by two police officers after a whole entire hour of negotiation. NBC News reports that McCarroll’s mother initially called police because her son locked her out of the house, where he was allegedly barred inside with several knives and samurai swords. 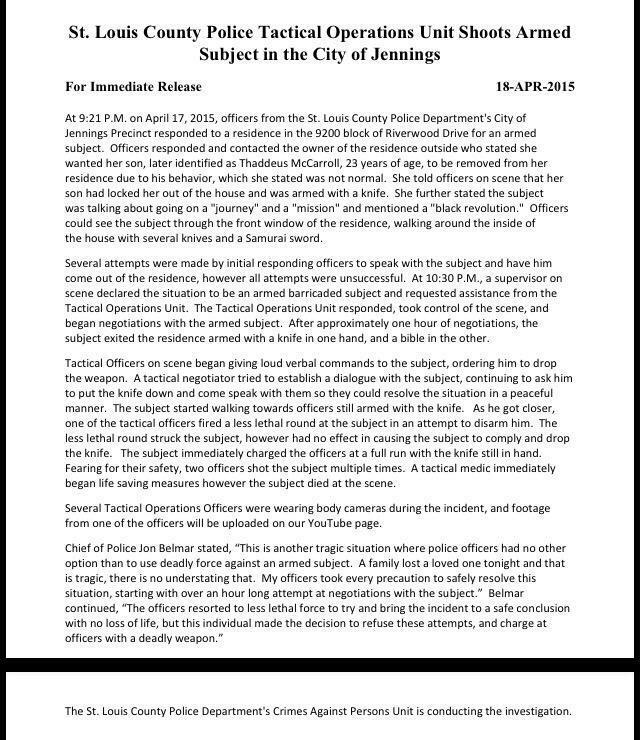 Also, the news outlet reports hat police released body cam video from the confrontation in the St. Louis suburb of Jennings hours after the incident. “The officers resorted to less lethal force to try and bring the incident to a safe conclusion with no loss of life, but this individual made the decision to refuse these attempts, and charge at officers with a deadly weapon,” said the statement. “After approximately one hour of negotiations, the subject exited the residence armed with a knife in one hand, and a Bible in the other,” according to police. Officers then tried to get McCarroll to drop the knife, firing a “less lethal round” at him in an attempt to disarm him and ordering him to speak with them without holding the knife — but that didn’t work, police said. Next: The top 100 list of the most Influential Christians in America has been released! Bishop TD Jakes kicks off one of the biggest Pastors and Leaders Conferences of the year today!